Kiniro Mosaic will get a second season called Hello!! Kiniro Mosaic. No more information has been revealed yet. Gochuumon wa Usagi desu ka? (Is the Order a Rabbit?) will also get a second season, but just like in Kiniro Mosaic‘s case, not much information is out yet. 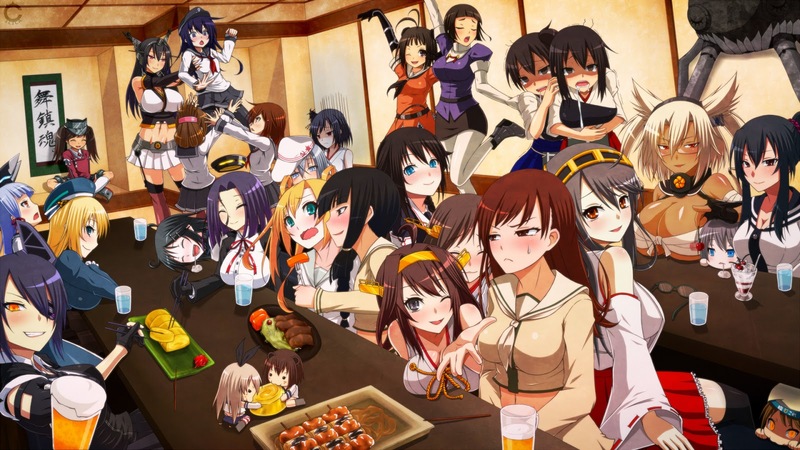 Originally, Kantai Collection was set to premiere this summer. However, they couldn’t make it, which is why it was delayed to Fall 2014. Unfortunately, this won’t happen either, and the new release date is set for January 2015. Let’s all hope that there won’t be any more delays. On a brighter note, Strike Witches‘ OVA Operation Victory Arrow will air in theaters September 19th and 20th. A third season has also been announced last year, so there’s a lot to look forward to! As many of you probably already know, Yuru Yuri will also get another season, but in this case it’s not exactly a new season. It’s an OVA, titled Yuru Yuri Nachuyachumi!. It will be released in selected theaters at the end of November this year. There’s also great news for the Love Live! fans, but the ones who watched the second season surely already know about this. So as it seems, there will be a Love Live! movie at some point, but I couldn’t find any more information regarding that movie. What I’m excited for the most is the news that there will be a special episode released with the Akuma no Riddle Blu-Ray set in December. I have no idea what it will be about, even though I have some assumptions. In other news, Studio Ghibli’s movie When Marnie Was There started airing in theaters this summer. I’ve only seen the trailer so far, and it surprisingly looks pretty yuri-ish to me. Well, I haven’t taken the time to look up more information about this movie, so maybe it’s not as yuri-ish as it looks at first glance. But since I’m planing to watch it anyway, I’ll surely find out about it soon. Finally, let’s also talk about the cancellation of the yuri magazine Hirari. Just like Tsubomi, Hirari is yet another yuri magazine that seemingly didn’t sell well enough. I can’t really say that this came as a surprise, but I’m nonetheless pretty sad to hear this. For the ones who have never heard about this magazine, it’s probably enough to say that Kase-san was one of the manga running in this one. Feeling down already? Well, we still have Yuri Hime magazine, and even some manga that run as online releases…. 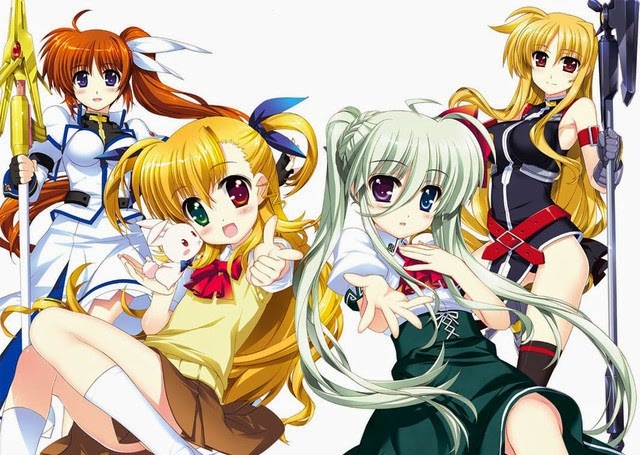 This entry was posted in 2014, Anime, News and tagged Akuma no Riddle, Gochuumon wa Usagi Desu ka?, Kantai Collection, Kiniro Mosaic, Love Live!, Magical Girl Lyrical Nanoha, Strike Witches, Yuru Yuri by Lena K.. Bookmark the permalink. As much as I will promote Vivid as being an amazing continuation to StrikerS, Nanoha and Fate are very minor characters in it, so watching it purely for their moments isn't the best of ideas. If you liked the Wolkenritter though, they've actually got a fair amount of limelight, seeing as how they're connected to the other lead character in this. About Gochuumon, I've only seen a single source for it, and it's some random 2Chan post. This may be a hoax. Vivid's got its website, and, like I said earlier, KinMoza announced its second season ages ago. The only actual news was that it would be called “Hello! Kiniro Mosaic”. This was confirmed on the official Twitter. I was also not sure whether the news about Gochuumon was legit. Couldn't find much, other than posts on like 2 websites and that one picture with 2nd season or whatever written in it. I'm going to leave this info where it is until someone can 100% prove me wrong. I know, that's probably not the best idea, but I usually trust YuriNation, which is where I got that info from. I think OG may have jumped the gun on this one. I mean, it feels like it's inevitable it would get another season, but I just don't think it's been announced yet. We'll know for sure in a couple days though. I doubt the official Twitter would neglect to mention something so important. Could just be too busy with Comiket stuff to update the site/twitter right now. You might be right with that, so let's wait and see. I think it's a shame that yuri's become more popular… Well, it's good to have more yuri < .< but we're losing some really good yuri series because of the cancellation of little magazines like those. On the other hand you might be right. Maybe it's also a problem that bigger yuri magazines like the Yuri Hime make it harder for smaller magazines to survive. It seems Kase-san will be continued at least, so at least that's good. zzzz….Let's not forget the other media….zzz….FLOWERS -Natsu hen- by Gungnir/InnocentGrey…..z……….zzz……..of course there are also….Bullet Girls (PS VITA)……and….”Adachi to Shimamura Vol.3″…….just released this month of August 2014…….zzz……. lawls, those are definitely important for the minority that we Yuri fans are. I'm not sure whether this one is really important right now. I guess I need to find some more information about it, but I think we can't really say whether it will have yuri or not. I didn't add the things that I already made announcement posts about. Flowers is one of them. Hopefully there will be more (positive) news in the future. Said it before and I'll say it again, 2014 is OUR year dawg. The third age of yuri keeps on going strong. Not any time soon I think. I haven't watched the show yet and I don't know when I'll catch up on that. Oh, I must;ve mentioned this before but Binchou-tan is another anime (in the 2006s) that you should watch should you ever need to take a break from the chaos of dramatic anime/life. I've seen the trailer for this one already, it's probably the closest thing to yuri we get for the next season. Well, I don't even know whether it will have any yuri at all, but I'm looking forward to it nonetheless. I hate how the Nanoha staff teases me with all their glorious subtext art. Wow, that is glorious subtext indeed. Actually that's not just subtext anymore. And here's a bonus bigger image of it.